Bogues Jewellers is an award winning 'family business' that has been providing diamonds since 1870. From our years of experience, we source only the finest diamonds from some of the most respected suppliers within the industry. 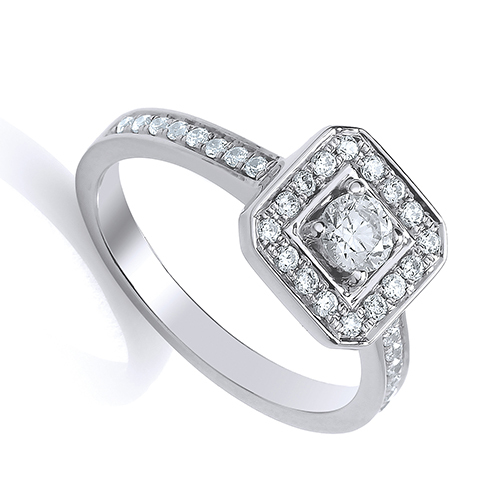 Our selection of diamond rings feature a wide range of different cuts; princess cut, round cut, square cut and many more. Whether you are looking for an engagement ring or a ring to mark a special occasion, our team at Bogues Jewellers will be delighted to assist you in your search. Diamonds are a sign of love and commitment. 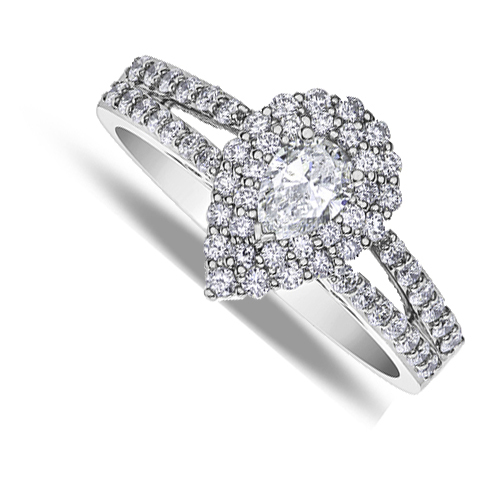 The Greeks believed that the fire in diamonds reflect the constant flame of love. The name itself says so as diamond came from the Greek word αδάμας (adámas) which means proper, unalterable, unbreakable, or untamed – just like romantic love. Diamonds come in nature's different shapes and sizes, before attempting to buy a diamond ring it helps to know something about the stone you are thinking of buying. The four Cs Clarity, Cut, Colour and Carat are used worldwide to describe the quality of diamonds. Most engagement rings are diamond engagement rings or rings containing diamonds because a diamond has the capability to refract more light than any other gemstone. Most diamonds will contain tiny inclusions, these are flaws which are known as nature's 'birthmarks'. Diamonds are rarely perfect, a diamond which is free of interior inclusions or exterior flaws and has nothing to interfere with the passage of light through the stone is considered to be of the highest quality and will add more value to the diamond. Most inclusions can't be seen by the naked eye. The number of inclusions, sizes and location all have an effect a diamond's clarity. However minor inclusions will not compromise a diamond ring's beauty. A diamond's size is measured by the carat weight and not by the size of the diamond. One carat is divided into 100 points, so a diamond of 75 points weighs 0.75 of a carat. A diamond with a large carat weight will make it a valuable diamond because of its rarity, however depending on the cut and set of the diamond's they can appear larger than its actual weight. Two diamonds of equal size can have very different values. A big diamond is not necessarily better, diamonds of high quality can be found in all size ranges. 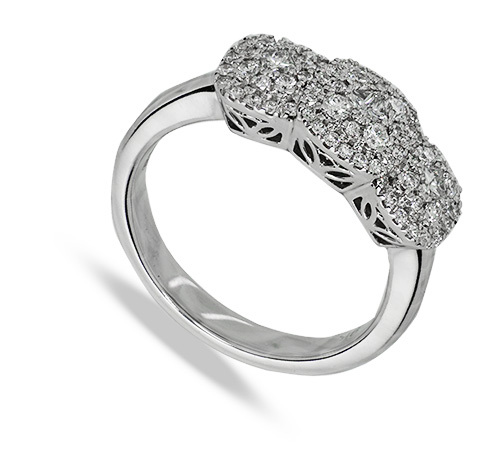 All diamonds within a ring refers to the total weight of all the stones altogether. At Bogues Jewellers we use the Gemological Institute of America (GIA) scale to measure colour. Diamonds are generally colourless or near colourless (they may have shades of yellow) but the difference between each colour grade is subtle. A diamond which is completely colourless is more desirable than one which is slightly yellow. A diamond which is graded D is colourless and a diamond which is graded Z will appear slightly yellow. Generally the best colour for a diamond is no colour at all these diamonds are known as white diamonds but in some occasions you may want to choose a diamond ring with a touch of colour such as yellow, green, blue, pink or even red, these are known as 'fancies' and are very rare and extremely valuable. The cut of diamond is to make the best use of light and ensures that your diamond ring is as beautiful as it can be. Skilled craftsmen turn a rough crystal into a polished diamond by using fine symmetry, proportions and angles. When a diamond is cut in the ideal proportions, light is refracted internally from one facet to another before being dispersed through the top of the stone set in your diamond ring. If the cut is too deep, some light will escape through the pavilion in your diamond ring before it can be refracted. A master cutter ensures full light dispersion, maximising the inherent beauty of the stone. Light travelling through an ideal cut diamond bounces back out the top of the stone, bringing its brilliance into view. A well cut diamond will sparkle and glisten. Our team at Bogues Jewellers understands the importance of choosing the correct diamond, we would be delighted to assist you if you require any expert guidance when choosing your diamond you can email or call Bogues Jewellers to speak to one of our diamond specialists.